The apartments are immersed in a lush pine forest and only 200 meters from Manacore Beach, which is a short walk away. 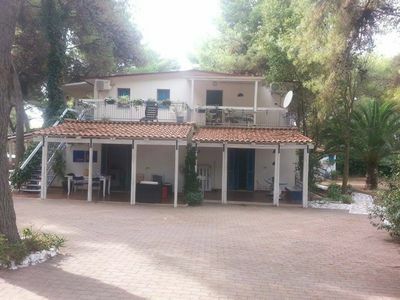 It is therefore a typical Garganica location, strategically located on the coast that connects Peschici to Vieste and lays around a dozen finely sandy beaches. About a mile from the property is the Sfinale bay, one of the most beautiful beaches in the area and about 5 km from Calalunga beach, another beautiful gulf. The resorts of Peschici and Vieste are about 20 minutes away by car, but you will not need to visit it every night, as nearby guests will find bars and restaurants within walking distance. In short, this is an ideal location for those who want to relax in a natural environment, easily reach the sea without the need of the car and escape the chaos of the facilities located within the country (which remain still fast reachable when needed). The structure consists of six apartments made of a large villa and three further bungalows located in the large garden surrounding the property. The apartments of about 35 square meters are equipped with a double bedroom, living room with kitchen and two further twin beds and private bathroom. The bungalows are almost the same size as they are composed of two small bedrooms (one double and one with two single beds), a kitchenette and a private bathroom. Both the apartments and the bungalows have an outside veranda for outdoor dining and dinners, and there is a barbecue in the garden for all guests. The apartments are all air-conditioned and the prices are inclusive of all costs, so guests will not have any additional charges unless they require bed linen, which we usually do not provide, and can be provided at a cost of 20 euros ; While the bathroom linen is not provided. The property also has private and private parking available for guests free of charge. However, the sea is not the only protagonist in our land: about 30 minutes from the property is the majestic Umbrian forest, an excellent alternative to the beach for those who want to spend a day hiking or for those who want to conquer A break from the hot summer days, maybe with a picnic in the shade of the lush vegetation of the Gargano National Park; Just as suggestive are the religious sites of San Giovanni Rotondo and Monte Sant'Angelo, the latter known for the Grotto of San Michele and its characteristic "bunch" historical center, both less than an hour away from the property.